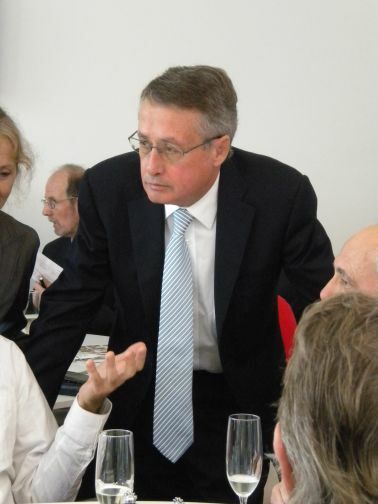 Australian Federal Treasurer, Wayne Swan, spoke at a fund-raising luncheon in Lismore on Thursday, 9th July, 2009. After his RAAF plane broke down at Grafton he traveled via the Summerland Way with Member for Page, Janelle Saffin, in a taxi. This trip gave him first-hand experience of road conditions in the area. During his address he admitted “We have a huge infrastructure deficit,” saying we hadn’t invested enough and that this would have to be addressed over time. He went on to list some of the government’s response to the crisis including two stimulus packages, the infrastructure investment program, primary schools building project and the guaranteeing of bank deposits. He spoke of housing, road rail and port, and coming energy efficiency initiatives. Of his critics he asked “What was the alternative?” and said to slash services or put up taxes would only be likely to make a recession longer and deeper. “It is the responsible thing to borrow and invest,” he said. He spoke of the success of the economic stimulus, saying “Yesterday’s data showed the best result since 1974” and said Australia is the only major advanced country to record increased GDP growth in the March quarter. Although we can expect a decline and there will be an ongoing need for stimulus, Mr. Swan was confident we would get through to return the budget to surplus and pay out debt. Of the Prime Minister, Kevin Rudd, the Treasurer said “Kevin 24/7 actually means something” and called him a “Force of Nature”. Wayne Swan is a survivor of prostate cancer and an advocate for the prostate cancer awareness campaign. He used the opportunity, telling a couple of jokes along the way, to encourage all men over fifty to be tested. The luncheon was held at the recently opened Tommy’s restaurant in Molesworth Street, with proceeds going to two charities: Our Kids and the Westpac Helicopter Rescue Service. The set menu was beautifully presented by Chef Tony Gibson, and was a credit to the establishment. I certainly look forward to dining there again.